The largest model in our best-selling H260 communal mailbox collection, the H260-3 Horizontal Post Box is well-suited to large office buildings, high-rise apartment blocks, and high occupancy student accommodations. EN13724 and Secured by Design Homes Guide 2016 compliant, it is the smart investment for any larger property. Offering a generous capacity of just over 32 litres, this high volume post box can accommodate large A4 documents and C4 envelopes without bending. Dimensions: 260 x 330 x 375mm (width, height, depth). 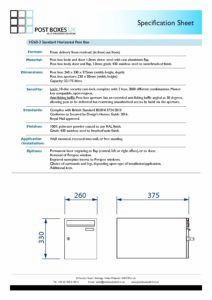 Despite its generous capacity, the H260-3 apartment mailbox offers compact dimensions that allow it to be easily incorporated into a bank of mailboxes. Post Boxes UK offers a full customisation service for those who would like to install a post box bank, which includes everything from the initial design drawings all the way through to delivery. Please contact us to discuss your requirements. The H260-3 communal mailbox can be wall mounted, wall recessed or left as a freestanding structure elevated on legs. Suitable for indoor and outdoor applications. The H260-3 horizontal mailbox if offered in over 200 RAL colours and finishes to complement all interior design projects and urban exterior landscapes. Fire retardant paints are available to meet Building Control and Fire Regulations and help property owners comply with BS476 directives. Other finishes include premium metallic finishes, such as gloss copper, black chrome, and satin stainless steel, along with multi-coloured mailboxes for a more dynamic and vibrant look. 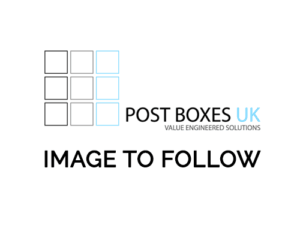 Post Boxes UK offers fast lead times of just 4 weeks for custom designed mailbox banks. The exact delivery and installation time frame depends on the size and complexity of each project. Please contact us for further information. 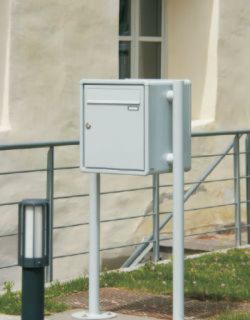 The H260-3 communal post box is constructed in robust weather-resistant 1mm electro-galvanised steel and suitable for indoor and outdoor installations. To give your H260-3 multi-unit letterbox a more professional finish, choose from our choice of finishing surrounds. Standard surrounds are available including 20mm/40mm recess trims, 2mm sheet cladding surround, and 20mm volume finishing surround. Those opting for H260-3 freestanding letterboxes have the choice of side support legs, pedestal support legs, or a combination of both. According to EN13724, the maximum recommended height for communal post boxes is 1800mm from the finished floor level up. 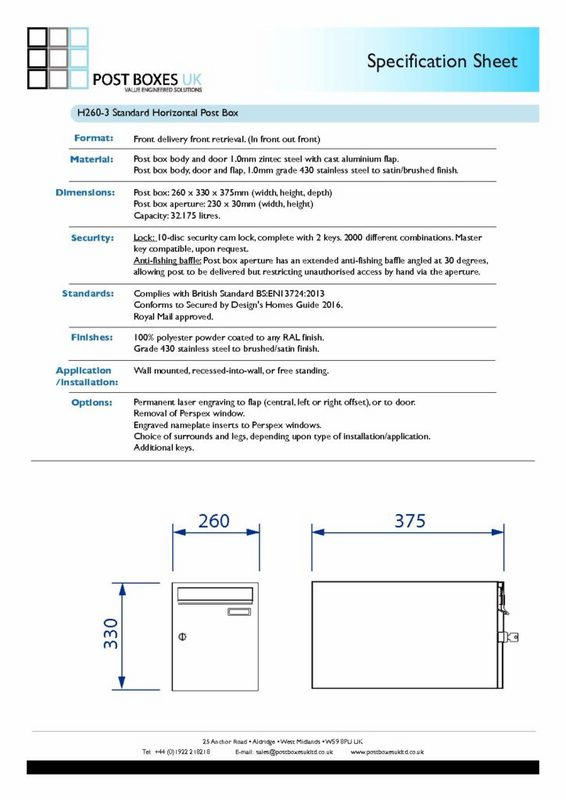 The H260-3 large communal letter box can be personalised with identification numbers, apartment numbering, or nameplates upon request. Laser etching and engraving options available. Please contact us to customise your mailbox. A non-mastered Eurolock Cam Lock comes as standard with the H260-3 high capacity mailbox. For those looking for a more robust locking system, Post Boxes UK offers master keyed locks, digital locks, padlock compatible locking systems, and much more. Please contact us for further details. To meet the needs of property developers, management teams, and multiple reception managers, Post Boxes UK offers replacement keys and locking system for all H260-3 Secured by Design mailboxes. Discounts offered for bulk enquiries. Fully compliant with the Secured by Design – Homes Guide 2016 police initiative, the H260-3 apartment post box is the safe choice for larger residential properties and business environments. It meets EN13724 requirements and it is equipped with an anti-fishing device to prevent unauthorised access. As the largest model in our exclusive H260 horizontal letterbox collection, the H260-3 is suitable for larger student accommodations, multiple occupancy apartment blocks and shared office buildings. Smaller options available within the range.